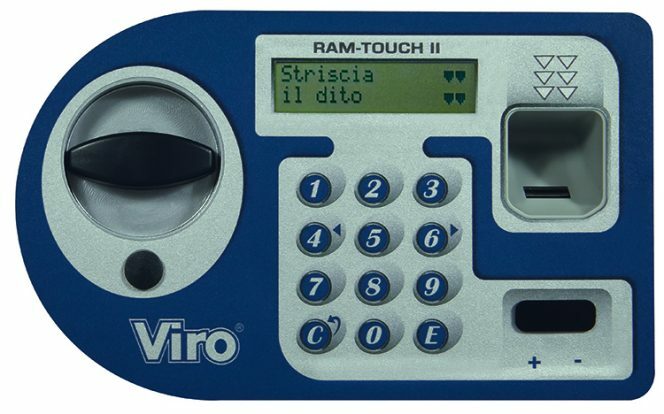 In the previous blog we have seen which locks exist for safes: mechanical, electronic, biometric. But let us now imagine that we are in a hardware store and that we have in front of us different models of safes: some expensive and others cheaper, of known and lesser known brands, simple and complicated. How do you understand which ones to take into consideration and which ones to discard because they are less secure? Some aspects, such as the quality of the materials, are not easily visible, but there are several clues which can help us understand if the safe we are looking at is designed and manufactured well or not. Let’s have a look at some. 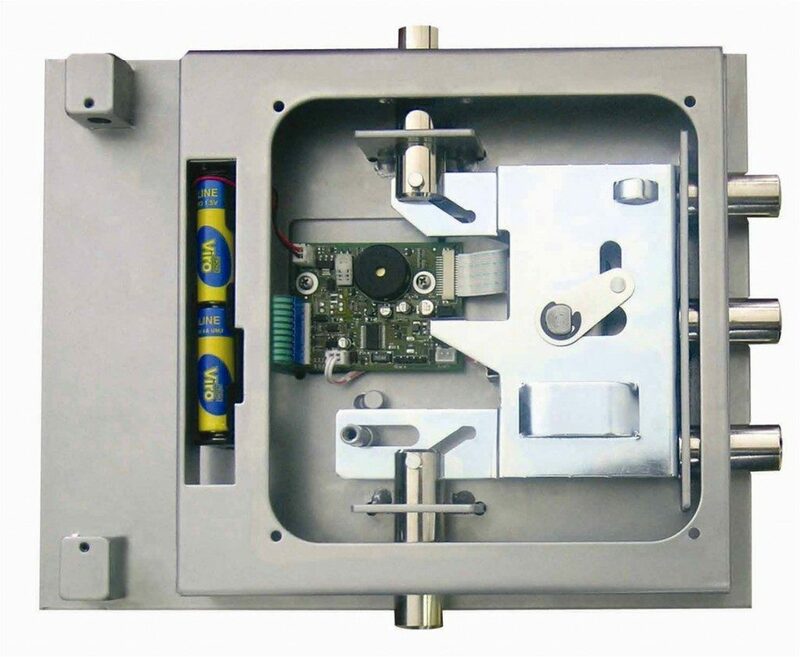 This is the most important part of the safe as it contains the opening mechanism, and it is through this that one accesses the inside. It is generally the most accessible and potentially weakest point and for this reason it is the first that we must pay attention to. How must it be built to withstand an attack? Single body. The frame, also known as the “front” of the safe, i.e. the outer part surrounding the door, must be joined to the case in a very solid manner, with robust and uniform welds. The frame and case must constitute a single body, to prevent thieves from detaching the frame and door from the rest of the case, by attacking isolated welding points. Flush. There must be as little space as possible between door and frame, so as to prevent the insertion of levers. Undercut. The most vulnerable side of the door is that of the hinges, around which the door rotates when opening. Here it is essential that the door should be “undercut”, that is, when closing the safe a part of the door must fit behind the frame, so as to resist attempts at unhinging by means of a crowbar. Hinges. 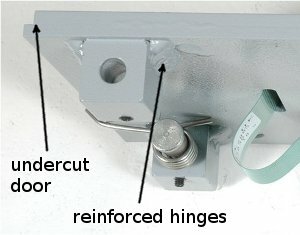 In order to resist unhinging and breaking in it is essential that the hinges are also manufactured with excellent quality materials and that they are joined to the case and the door with strong welds. In order to provide larger welding surfaces the outer shape of the hinges should not be round, but should have straight sides (e.g. square, hexagonal) so that they can adhere to the door not just at a single point (as is the case for cylindrical hinges) but over an entire surface, which can all be used for welding. 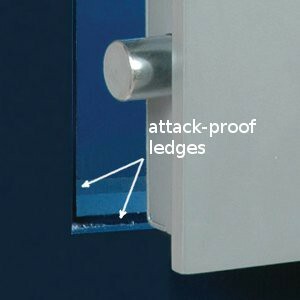 Attack-proof ledges. In order to resist attacks to break in as much as possible, the door, besides being sturdy, must rest on attack-proof ledges inside the safe, between the frame and the case. These components, along with hinges, are the ones which mainly absorb the blows. The ledges must be present on all sides except for the side with the hinges which, as we have seen, should be undercut. They must be large and thick, not made merely by simply bending the sheet metal of the body, and they should be joined to the case by strong, continuous welding. Replaceable door. This does not affect the resistance, but can represent a very practical solution. 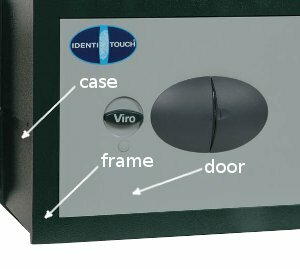 It makes it possible to repair the safe in the event of a fault, or following an attack which has damaged the door, without having to replace the already installed case, which would mean removing the entire safe from the wall (wall versions) or removing the expansion plugs (free standing versions). Contrary to popular belief, the weight is not necessarily an indication of quality. Thieves obviously try to attack the weakest points of a safe. Therefore, if the walls are thick, but the ledges of the door, the hinges or the lock are weak, any thieves will focus their attention on these points. The quality of materials and workmanship required means that, at the moment, the safes offered to the public at a price of just a few tens of Euros, instead of hundreds, cannot offer an acceptable level of security, but tend to resemble simple cash boxes. Purchasing products for just a few tens of Euros does not mean saving money, but, on the contrary, it puts one’s assets at risk. These are just a few features that a safe must possess, regardless of the size or type. 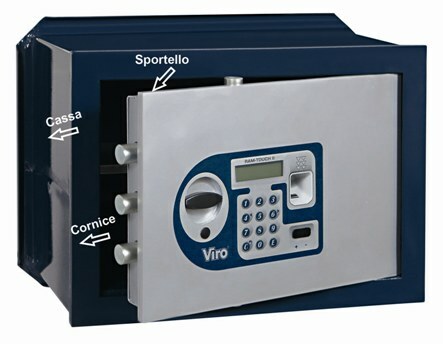 But the choice of which safe to buy also depends on several other factors: planned position (free-standing or built-in), size, type of lock, etc. We will look at these points in a future blog: keep following us. This entry was posted in Safes and tagged tips on 5 July 2018 by Mara Rossi. 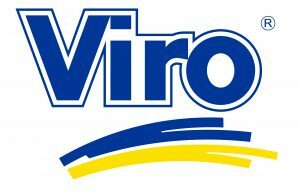 I am someone who is always wanting to be prepared and making sure that my family is safe. One part of this is making sure that our important documents are also well protected. I would like to invest in a safe, but I would like to have a few suggestions on how to know that I am getting a good quality one. It’s good to know that one thing to take into consideration is the price, that a more expensive one will have a more acceptable level of security then a cheaper one. This is something that is a harsh reality, but you do really get what you pay for. Thanks for all of the different insights about what I should look for!